I've been on a quest for a while -- for new lamps for the guest room. It's not that I "hate" the ones that are there -- it's just that I think I could find something better. They're tall and when reading in bed you have to really stretch to turn them out -- and after reading to get sleepy you don't need "exercise" before you lay your head down on the pillow. And this weekend we were in the city . . . and we happened to stop by Tuesday Morning and there was a lamp -- a wonderful lamp -- at a great price -- but it was just a lamp! And I needed two. I bought it anyway and then went on another quest . . . . to find a second. And at the second Tuesday Morning, there was another. In my hurry to snag the lamp I almost knocked down two ladies who were looking at a different lamp! Sorry!!! But that one was mine! One for each side of the bed. I like them. They're floral as is the wallpaper but it's tulips rather than roses. But there is a yellow tulip on each as well as a red one which picks up the red of the pillow on the bed. They have a metal shade which gives a nice downward glow which is great for reading in bed. And the switch is by the base -- no endless reaching to turn off the lamp. 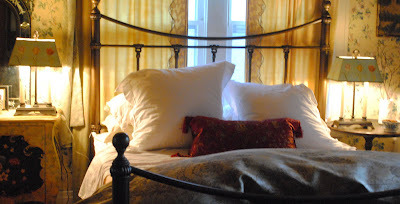 It's Monday which means that it's time for Met Monday -- and my lamp switch in the guest room is a metamorphosis of sorts. So I'm joining Susan at Between Naps on the Porch for Met Monday and since the lamp shades are a soft blue it's also time for Blue Monday with Smiling Sally! What a great find! We don't have Tuesday Morning up here, but there is one in Everett, and when I go down to WA it's on my list of must-visits! 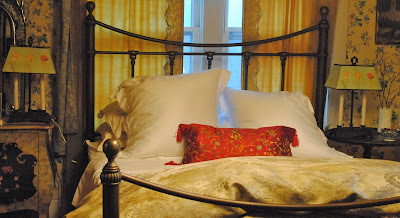 I think the lamps are perfect for your guestroom. Very pretty lamps. They look perfect in your guestroom. Oh wow! Job well done/quest accomplished! Hope you are feeling bionic very soon! Tuesday Morning sounds like a wonderful place to visit - I've never heard of it. Your lamps are a beautiful find - they go well in your guest room. Those lamps are amazing and look so good in your beautiful guest room. anywhere I look at this photo, It's just amazing..love all those .. perfect room. We all need changes in our lives. Yours happened to be your lamp. You have a lovely home with just the right touch of blue shining through. Beautiful...the lamp shade is perfect!I haven't been to Tuesday morning in years...good find! I love those lamps. That blue is so perfect for a bedroom. Perfect reading lamps for the room. And I adore the shades. Great finds! Jane F.
Way to make it happen. The room is fab! Martha, they are lovely. I have the same problem with my reading lamps in the bedroom. Much as I like them, they are tall and I have to reach too...hmmm...maybe it's time for a change for me! What a gorgeous room! Love those lamps! Wish we had a Tuesday Morning here. I am going to check out their website, to see where the closest one is. A perfect addition to your guest room, lucky guests. Your room looks beautiful. 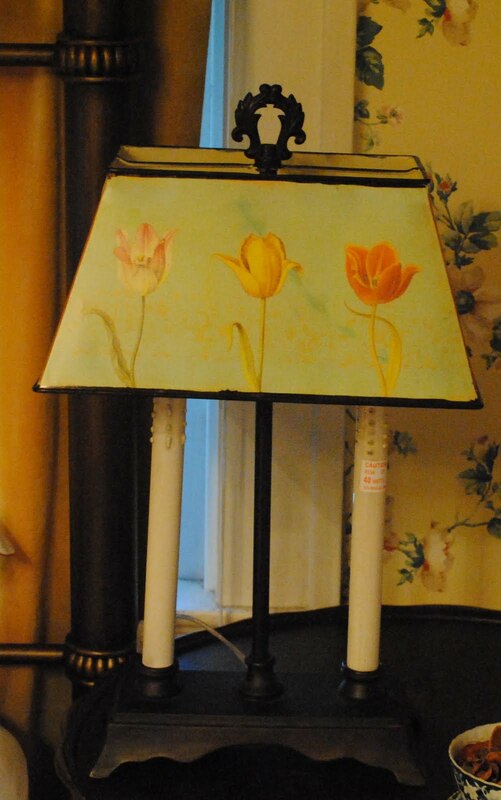 What special lamps, they are just right for your room. WOW! What a great fine. . . two lamps (the same) but at different stores! You're one lucky lady! I really think the colors blend harmoniously with all the other blends in the room. Thank you for an inspiring post of great finds for functon and style!